If you’ve never tried an E.l.f. product, then you probably know it as the drugstore brand that’s sold at super-cheap prices. 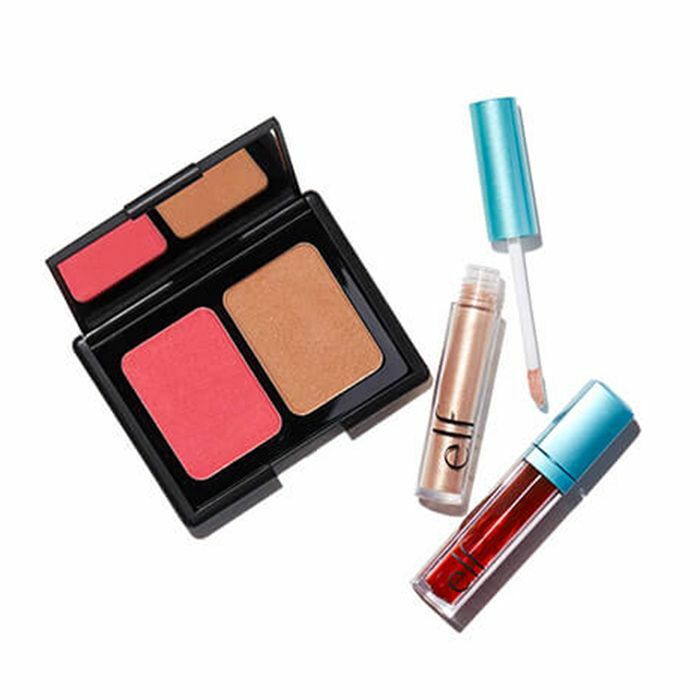 (We’re talking $3 for blush and $6 for foundation.) Don’t let the price point fool you, though: The color payoff and long-lasting nature of the makeup products are comparable to department store brands—it’s almost like you’re stealing them, shelling out only a few bucks for a product you could have easily gotten from Nordstrom. The brand has also ventured into skincare and boasts a huge collection of cleansers, moisturizers, sheet masks, and balms. It’s your one-stop source for your entire beauty regimen (save for hair—the brand is called Eyes Lips Face, after all) without spending an arm and a leg. We were curious how the brand is able to produce so many great products for such little cost, so we turned to its vice president of brand, Mara McCune, for the skinny on the beauty giant. We also picked up a lot of interesting intel about E.l.f. as a whole from its most popular products to the secret compartments you may not know exist. Keep scrolling to learn more. E.l.f. was founded in 2004 by father-son entrepreneurs Alan and Joey Shamah. The two of them collectively spent over 30 years in the apparel business and noticed the growing success of fast-fashion players who are able to churn out millions of garments annually. “They believed that a similar opportunity existed in cosmetics, where the traditional beauty model of high prices, long product cycles, and traditional advertising was out of touch with changing consumer behavior,” explains McCune. Though, unlike large apparel chains that regurgitate clothing with quality that often matches its cheap prices, the Shamahs sought to create a brand that performed well above its price tag. And the proof is in the pudding, or, more specifically, the whipped highlighter: Over a decade ago, E.l.f. adopted a direct-to-consumer method of sales and sold its products for a mere $1 each via a direct-to-consumer site, subsequently winning its first Allure Best of Beauty award in 2008 for its Shimmering Facial Whip (one of this editor’s very first beauty purchases). In addition to selling beloved products for a head-scratchingly low price, the company turns out an equally perplexing amount of products a year: “In 2016, we launched over 90 new products. That’s more than one a week,” McCune tells us. At this rate, we wonder how the brand is able to produce such high-quality goods at such low prices yet still maintain an impressive revenue. With such a high production rate, keeping up with trends (and starting new ones) seems like a tall order, but another impressive facet of E.l.f. is its ability to push the envelope with innovation. McCune notes that the brand has recently taken cues from Korean beauty to create products like the Hydrating Bubble Mask and Hydrating Water Sheet Mask, but its own conceptions like the Beautifully Precise Multi Blender Massager and “surprise” components in its lip products like the secret lipstick compartment and sharpener in the base of the Matte Lip Color ($3) helps the brand stand out even further. So what’s next for the brand? McCune played coy and said that we’d have to wait and see, but that the company is constantly teasing new launches on its Instagram page to satiate your E.l.f. hunger in the meantime. Want more beauty on the cheap? Check out the $1 products you didn't know you needed.